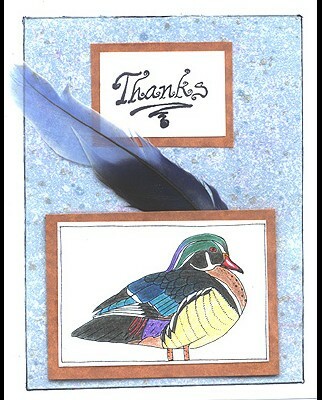 “Wood Duck with Border” is stamped with a Memories black ink pad, trimmed inside the frame of the stamp and colored with pencils. This piece is layered on brown card stock. A feather is placed under this piece using foam mounts and is adhered to background card stock layered on white card stock. A black line is drawn around the 4 sides of the background card stock. “Thanks! #4” is stamped with a Memories black ink pad, layered on brown card stock and placed at the top of the card. Card by Margaret Wiggin.